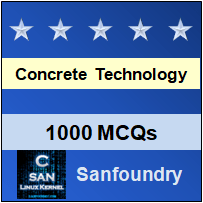 This set of Concrete Technology Multiple Choice Questions & Answers (MCQs) focuses on “Permeability”. Explanation: The addition of a pozzolanic admixture such as fly ash reduces the C3A content of cement. 2. Lowering of ____________ might also help, since this would reduce the amount of CH that forms. Explanation: Lowering of C3S might also help, since this would reduce the amount of CH that forms. 3. When the ____________ content is low, most ettringite will be formed in the plastic state. Explanation: When the C3A content is low, most ettringite will be formed in the plastic state. 4. The philosophy of prescribing low ____________ cement to improve resistance to sulphate attack. Explanation: The philosophy of prescribing low C3A cement to improve resistance to sulphate attack hinges on the need to minimize ettringite formation after the concrete hardens. 5. The quality of concrete, specifically a ____________ permeability, is the best protection against sulphate attack. Explanation: The quality of concrete, specifically a low permeability, is the best protection against sulphate attack. Explanation: Higher is the aggressiveness of the environment lower should be the w/c ratio. For concrete exposed to a very aggressive environment the w/c should be lower than 0.40. 7. The quality of concrete, specifically a ____________ w/c ratio, is the best protection against sulphate attack. Explanation: The quality of concrete, specifically a low w/c ratio, is the best protection against sulphate attack. 8. The quality of concrete, specifically a ____________ cement content, is the best protection against sulphate attack. Explanation: The quality of concrete, specifically a high cement content, is the best protection against sulphate attack. 9. Concentration of water-soluble sulphates in water ___________ ppm for mild exposure. Explanation: Concentration of water-soluble sulphates in water less than 150 ppm for mild exposure. 10. Concentration of water-soluble sulphates in water ___________ ppm for severe exposure. Explanation: Concentration of water-soluble sulphates in water 150-10000 ppm for severe exposure.